So get this. In the Marvel Universe, you can have antlers, but you’re not a mutant. The crux of the current X-Factor post-Messiah Complex storyline is that there’s a new tension brewing in Mutant Town. The de-mutified mutants who look like normal humans are now called “PANS” – Pass As Normal. And people with “horns, bone crests, the odd tentacle … that kind of thing” are now called “Rems,” short for Remnants. Here’s the thing, though. Wanda Maximoff didn’t say “No more powers.” She said “No more mutants.” Wanda didn’t take people’s powers away, she took the mutations away. You know what? If you’ve got two horns growing out of your forehead, you’re a mutant. You know why? Because you’ve got a freaking mutation, man! What are “powers,” anyway? They’re abilities that are useful, arguably beyond the abilities of non-mutants, right? Can we agree on that operating definition? Things like telepathy and super strength are powers. Well you know what, if I’m stuck on a desert island with a bunch of canned food and no can opener, all of a sudden horns are a hell of a lot more useful than telepathy. So we’re supposed to believe that all these people with tentacles, antlers, extra limbs, etc., are not mutants. If you an accept that stupid scenario, then you’re probably going to get really wrapped up in the drama of X-Factor #28. Accepting the stupid scenario, it’s not bad. But you have to just accept that they’re choosing to sell you a story based on a premise that makes no sense. Speaking of stupid scenarios in the post Messiah Complex X-universe, I already moaned about it, but the premise of X-Force #1 just leaves me annoyed. The problem with these things is that there’s nothing inherent about these stories that requires this nonsense. It’s just superficial drama. My big problem with X-Force is the philosophical situation set up in which Cyclops thinks he can keep the X-Men’s hands clean by having X-Men dress up in different costumes and call themselves X-Force. The leader of the X-Men is still ordering these hits. The reason I think my nitpicking is more than just standard complaining is because we are supposed to buy these comics because we’re supposed to care about these characters. Now I think Wolverine’s ethical dilemma in this book is pretty interesting, not wanting these kids to throw away their moral compasses like he has. 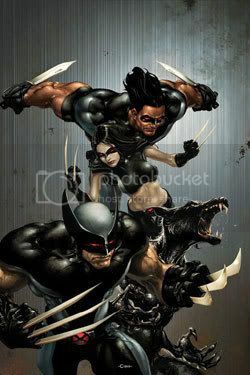 But these kids are being used as weapons – just like in Weapon X, and those guys were bad guys, remember? – by Cyclops. It would be one thing if I felt there were any indication that Cyclops were being set up for a judgment of some sort, but I don’t get that feeling. Instead, I get the feeling that this is just a shallow way to prop up Cyclops as the new and improved Tougher Scott Summers who’s doin’ what it takes to get the job done! And now the bad guy is Bastion, basically a killer robot in human form. 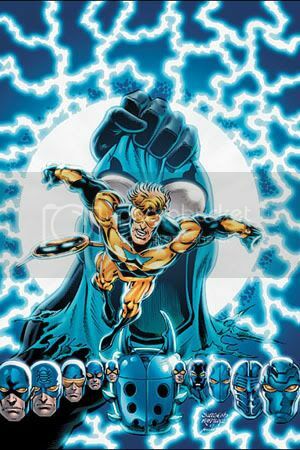 Well heck, speaking of killer robots who take human forms, that leads me to Booster Gold #0. A bunch of Blue Beetles gathered and plucked Ted Kord from the timestream right before he got killed, and the rest of the DCU still thinks he got shot in the head. You see, that prevents all kinds of other complications from arising, since his death was so instrumental in getting Infinite Crisis to happen. So instead, rather than something complicated, we are supposed to believe that Ted didn’t get shot, and a bunch of people think he did even though they would have absolutely no reason to believe that happened. Oh and a bunch of OMACs show up at the end. I’m not sure which has infected more comics, Countdown or OMACs. But hey, speaking of bad guys who are secretly hiding within normal looking people, that leads me to New Avengers #38, officially part of the Secret Invasion. 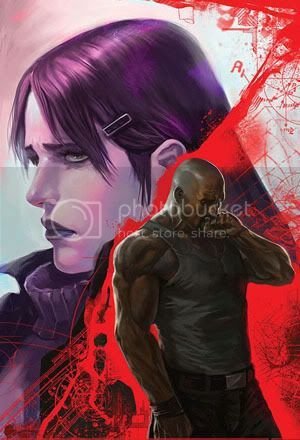 I’ve long said I appreciate this book for its character moments as well as its action, so an issue full of the drama between Luke and Jessica is all right in my figurative book. And normally I’d be bummed that Leinil Yu is gone, but the art is by Michael Gaydos, which is very appropriate considering it’s a Jessica Jones story and he was the artist on the fantastic Alias series. My one complaint here really has little to do with this issue and instead is about the pacing and physical placement of this story. The lead-in to this issue happened in New Avengers Annual #2. What is the point of doing that? Why not just make all of this happen in the same series? I liked annuals back when they were either self-contained stories or self-contained crossovers (and though that sounds pretty oxymoronic, I mean they were crossover stories between several other annuals). Nowadays, things like annuals or wedding specials are really absolutely nothing other than crucial chapters in a bigger story that are pointlessly plucked out and put into a different book. It’s like everyone’s taking the absolute worst lesson from Countdown and applying it elsewhere. If anything, put last issue in the regular New Avengers and put this story in an annual. This is the type of story that would be better standing alone, whereas that story needed to be injected into the serial. I like stories like this, but this book does need some action. Somebody needs to start beating on a Skrull. There has been enough buildup now. Thanks to the Messiah Complex, I decided to keep buying X-Factor, since everybody has told me it’s great. Too bad it’s not. I think you’re too hung up on this mutant thing. These people aren’t mutants anymore, they’re just deformed. They don’t have the mutant gene or it’s repressed or whatever, and the horns are like scar tissue now. Also, it’s been stated before that Wanda’s magic wasn’t perfect. She did say “No more mutants,” but you choose to focus on the fact that some folks still have deformities instead of, y’know, the fact that there are still plenty of mutants around. X-Factor 28 is getting back closer to what the book normally is, but it isn’t there yet. I’m holding out hope. And the thing about aspects of mutations still being around isn’t new. That’s been touched on in the follow-up to House of M (what was that piece of crap called?) and previously in X-Factor. I think it’s even been explained that, as Finny said, it’s essentially scar tissue. Like with Blob, he lost his power, so he was just a normal guy with all this loose skin hanging off him. I’m not trying to say it makes sense, but they did at least try to explain it, which is why I don’t have a problem letting it go. So what if you were a mutant, and your only mutation was that you had horns. How would you know if you had been de-mutantized or not? At least, on the scale of comic book logic, the de-mutantifying makes way more sense than everything in Countdown.